In the land of sun, tropics, and beaches, bare feet, or better yet, exposed toes are a given. 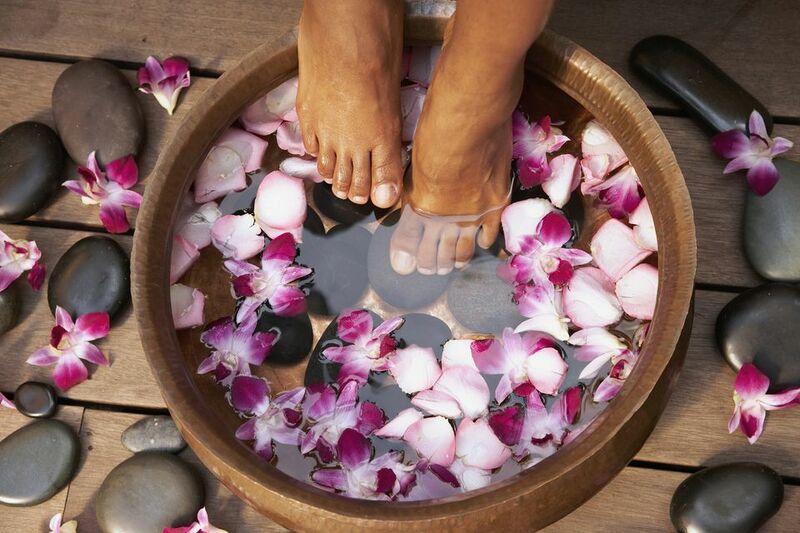 But in the midst of work and life, we forget sometimes to pamper our feet. If you need an excuse to set a pedicure appointment, here are some benefits you may not have known: the accompanying foot massage to a pedicure can help you sleep better, soothe arthritis pains or overworked extremities, increase blood circulation and hydrate dry feet. Not to mention the total relaxation and confidence boost a pedicure provides. There's just something very appealing about a couple of fresh coats of hot pink nail polish. Get ready to set up an appointment as at one of the top 4 local nail salons offering pedicure services in Oahu. If you suffer from extremity pains, La Jolie is great for you. This salon is known for their impeccable customer service, cleanliness, and artistic designs. For $38, the "Jolie Pedicure" includes a standard pedicure, a complimentary drink, sugar scrub, mask, and a well-deserved massage to melt away your stress and foot pain. The atmosphere is friendly and welcoming and has great parking. If you are really particular about specialty designs on your nails, and nothing else, then Salon Chérie is perfect for you. The ladies who work here are experts in their craft. In fact, they serviced Elton John and Erykah Badu's nails. For customers who need inspiration this salon has ample portfolio books and photos to browse through. Although massage is not included with their standard packages, customers leave the shop with smooth, clean, and aesthetically pleasing hands and feet. If you love maximizing your time, Pure Nails is right for you. Its located right inside of Don Quijote, so before or after your nail appointment you can pick up some groceries, make a deposit, get your watch fixed, buy lunch and so much more. Another major advantage is that its the only nail salon that is open until midnight. This cozy place specializes in designs and has an impressive selection of nail polishes ranging from OPI, China Glazes and even several brands found only in Japan. If you are not at all concerned with fancy designs and more keen on finding a nail salon that specializes in relaxation, then Princess Nails is right for you. Their nail polish color range is not as extensive as Pure Nail, so feel free to bring your own color. They are known around town for providing the best foot and leg massages. The average appointment time is 1 hour and 30 minutes and roughly 30 to 45 mins of that time is spent with a pre-exfoliating massage and final lotion massage. Tina, Rose, Lynn, and Thai are phenomenal with their customer service and they make it their mission to treat each customer like the "Prince" or "Princess" they are. Tip: They prefer appointments, call ahead.